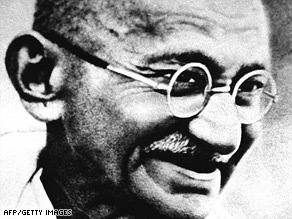 India is trying to reclaim the famous metal-rimmed glasses and other artifacts once owned by freedom leader Mahatma Gandhi that are up for auction next week in New York, a top official said Saturday. “The government will be doing whatever is required to get them back,” India’s culture ministry secretary Jawhar Sircar told CNN. He said there were “several options” in place for India. When asked whether India planned any indirect participation in the bidding reportedly scheduled next week at the Antiquorum auction house on New York’s Madison Avenue, he said it is one of the “speculative” options. “I can’t disclose what (exactly) those options are. But we are doing something,” Sircar remarked. The glasses are scheduled to be auctioned off along with Gandhi’s pocketwatch, sandals, bowl, and plate with letters of authenticity, according to the Web site for Antiquorum, which specializes in watches. The glasses and other items are estimated to sell for as much as $30,000, the Web site said. Gandhi, who waged a long struggle against British rule in India, was assassinated in Delhi by a Hindu fanatic on January 30, 1948. He is still widely revered for his insistence on non-violent protest to achieve political and social progress.